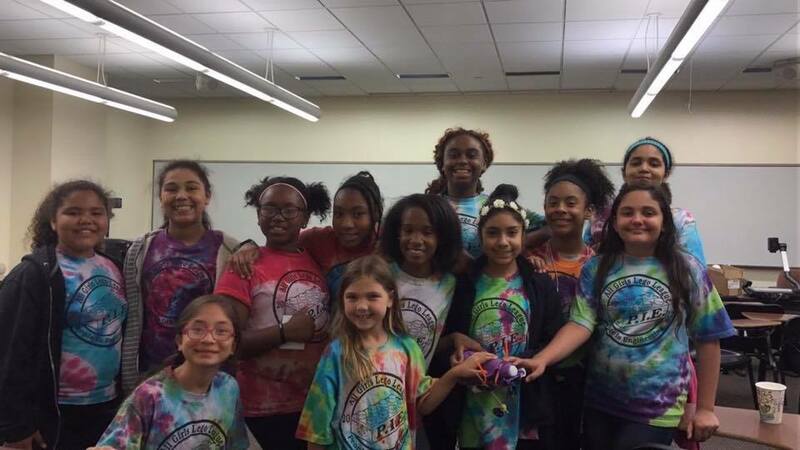 The 2nd annual All Girls FLL Challenge took place on Saturday, May 20th on IUPUI's campus and hosted almost 60 girls. Representing Avon, Bedford, Fort Wayne, Hobart, Indianapolis, Martinsville, West Lafayette, and Zionsville, 12 teams participated in this day-long, off-season event that focuses on boosting the confidence of females participating on robotics teams. 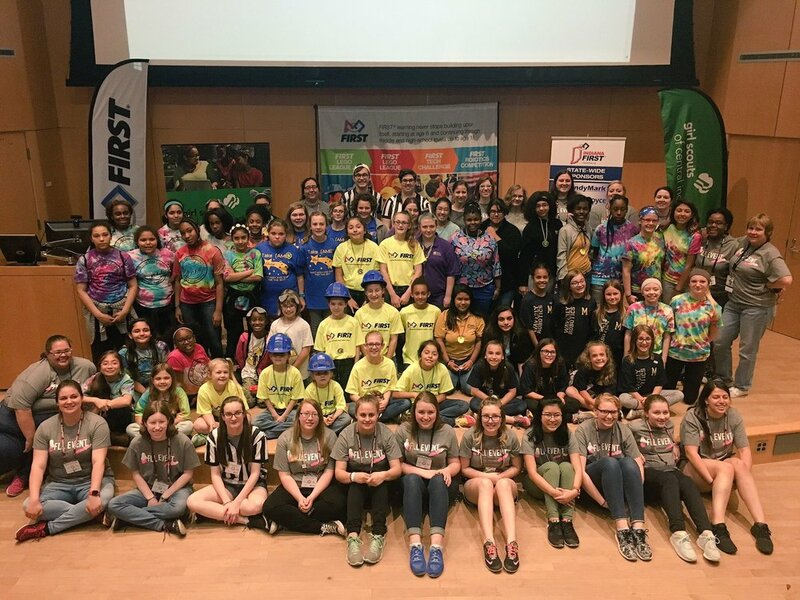 The event was planned and hosted by an all-female steering committee comprised of staff from the Girl Scouts of Central Indiana, IndianaFIRST, the School of Informatics & Computing, and TechPoint Foundation for Youth. Judges Ashley Looper & Katie Richmond pose with Ruby Roo. Similarly to last year, the opening ceremonies were followed by three, 1-hour long sessions that allowed the girls to experience the virtual reality and media labs during a building tour with IUPUI students, practice with their robots to prepare for the afternoon's competition, and work together on this year's Sisterhood Activity. The Sisterhood Award is based on the successful completion of the activity, which changes every year to reflect the FIRST LEGO League challenge. Since this year's challenge was Animal Allies, the steering committee wanted an activity that tied engineering and design concepts to animal welfare so we invited some guest judges to help us pull it off! A team of girls works together to design their prosthetic concept for Ruby Roo. Ruby Roo, a chihuahua born without her front legs, was the star of this year's Sisterhood Activity. The girls were charged with designing a prosthetic concept for Ruby that was not too heavy or too light or too cumbersome - all problems she's faced with past prosthetics. Her owner, former veterinary technician Ashley Looper, talked to the girls about various animal prosthetics while Katie Richmond, a certified prosthetist/orthotist at Prosthetic Solutions of Indiana, told them more about prosthetics for humans. After learning from our judges, the girls got to meet Ruby and then use craft supplies to create their own prosthetic designs. There were lots of exciting ideas! After lunch, the teams presented their prosthetic ideas to Katie, Ashley, and Ruby in hopes of winning the Sisterhood Award, and participated in the Animal Allies robot competition in the auditorium. A girl-powered team of volunteers was instrumental in making the event a success! Congratulations to all our teams for a fabulous day of STEM learning & thanks to our volunteers for making this event possible!